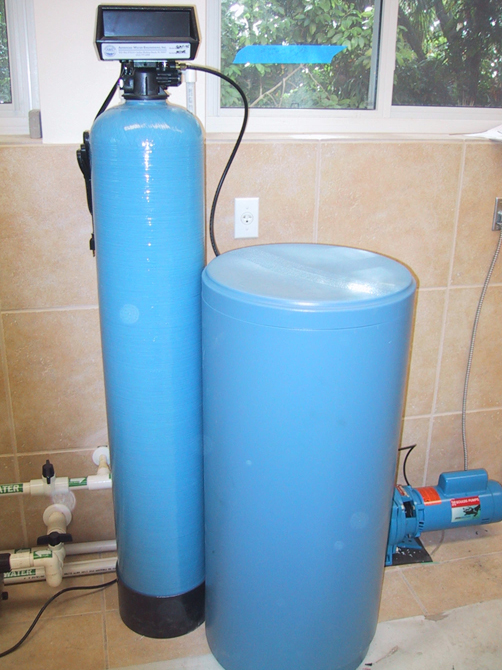 All Ion-Exchange Water Softeners exchange Sodium or Potassium for Hardness in the water. Hardness is usually defined as Calcium, Magnesium, and Iron. The elements combine with Natural Carbonates in water to form scales or “Lime scales”. Lime scale is insoluble and therefore doesn’t redissolve easily. Small amounts of lime scale will result in “water spots”that are hard to remove without harsh or acid cleaners. Sodium and Potassium salts will not form lime scales and therefore can usually very easy to remove with just a damp rag. Hardness also reacts with the surfactants in many soaps and therefore is responsible for “ring around the tub” and other spotting issues. Hardness also consumes the soaps that are used around the house preventing them from properly cleaning. This is why detergents are added to dishwashing soaps and Laundry soaps. The detergents “tie up” the hardness allowing the soaps to clean. Softening allows soaps to work better and therefore Laundry is cleaner, spots come up easily, and dishware is clean and clear from your dishwasher without adding rinse additives. We offer two residential softening systems. We also have a system designed primarily for condos and modular homes. All three versions are available in a Demand Intiated Regeneration and a timed regeneration. Softeners are usually rated in Kilograins (kgr) of Capacity. Many marketers would like to have you believe that this capacity number will tell you how many gallons per minute that the softener can soften water but this is completely untrue. It is only a measure of how many gallons can be treated at a certain hardness. For example: If a laboratory says your water is 5 grains per gallon hard, and you have a 1000 grain (or 1 Kgr) water softener, you can soften 200 gallons before its capacity is exhausted. This has no bearing on how fast the water is flowing. One must use compensated or hydraulic engineering calculations to determine maximum florates on a softener. Our softeners are based upon a Modified Fleck 5600 head. We have modified the controls for lower than average pressure drop and use silicon based seals instead of the normal materials of construction. The tank is the highest quality Structural Fibers brand with Industrial grade resins. Our residential units can be run as high as 20 gpm without significant pressure drop. Tank dimensions are 10″diameter by 65″ tall. Brine tank is round polyethylene 18″ diameter x 33″ high. The unit is supplied with a brass single lever by-pass. The brine tank will hold about 250# of salt. The unit is available in blue as shown (attached) or tan color. There is a 7 year parts warranty. Although we typically offer our residential softeners in a 32 kgr or a 45 kgr model, we can build any size for your requirements. BRINE TANK SIZE 18" X 33" 18" X 33" 18" X 33"